A twenty minute light aircraft transfer from Maun over the south-western Delta. On arrival at the private airstrip on Ntswi Island, you will be met by welcoming hosts and shown to the Camp. Gunn’s Camp is one of the last few remaining luxury, vintage safari camps. Overlooking the legendary Chiefs Island and bordering the Moremi Game Reserve, the camp is located under leafy palms and African Ebony trees. It blends in naturally with the beautiful surroundings. Gunn’s Camp attains a fine balance of comfort without separating guests from the sights and sounds of their surroundings. Get away from busy lifestyle of today’s modern world and lose yourself amongst the solitude and tranquillity of Gunn’s Camp. 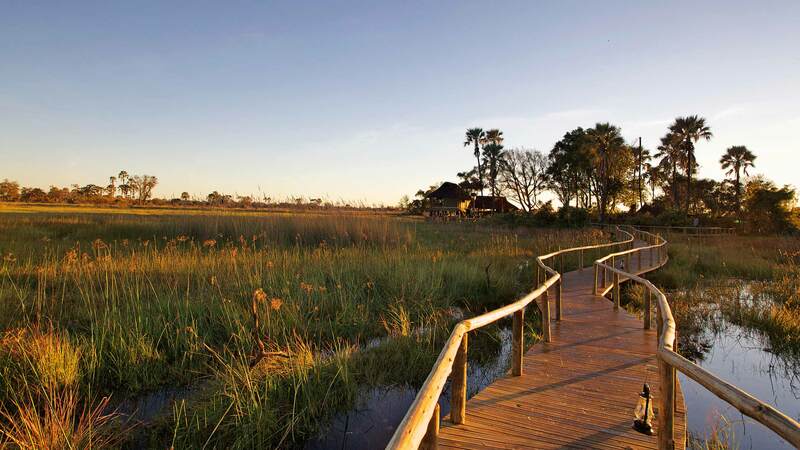 Affordability, legitimacy and a complete Okavango Delta experience is what you can expect from this time-honoured tented camp. The flagship accommodation offered at Gunn’s Camp consists of 6 fully furnished, deluxe Meru tents with en-suite bathrooms featuring standalone baths and outside private showers. All spacious tents have generated electricity and are comfortably furnished with solid wood and African touches. Each tent has a cosy lounge where guests can relax between activities, as well as a private veranda – the perfect spot to take in these beautiful surrounds Gunns Camp has to offer. Select from a light breakfast or a cooked breakfast that can be arranged to fit in with your daily activities. A delicious lunch is served at the camp or you can opt for a picnic lunch out in the wilderness. Dinner is either a 3-course meal in the dining room, or a barbeque dinner around the campfire. 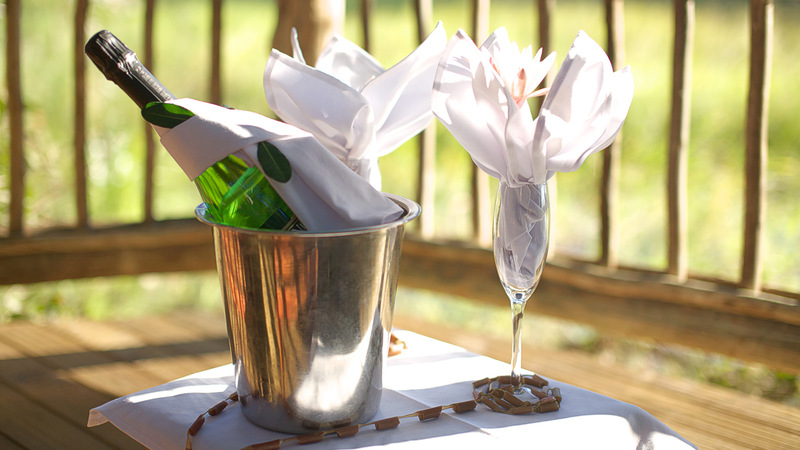 Honeymooners will enjoy a lovely surprise private breakfast or dinner, served on their own veranda. Become part of the bustling river life by easing between the papyrus clad banks on traditional ‘mokoro’ canoes. These are propelled from the stern by skilled ‘poler’ guides, allowing the guests to sit back and absorb the scenery. For full day trips, Gunn’s Camp prepares delicious picnic lunches which can be enjoyed on a Delta island after an exhilarating bush walk. 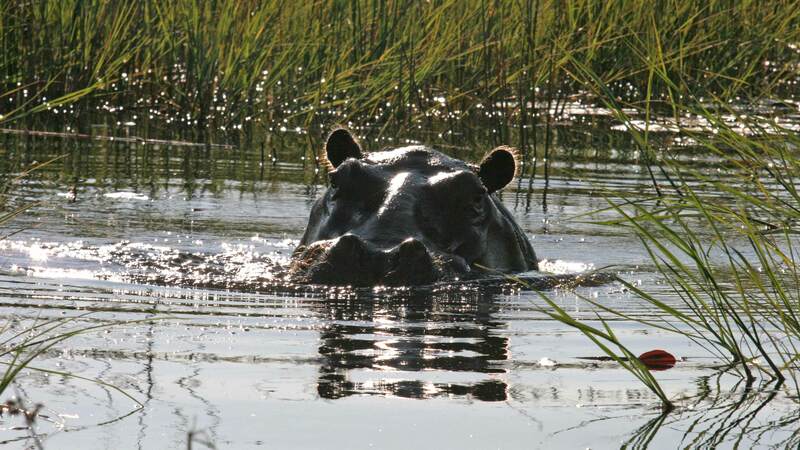 Motor-boat cruises are organised in time to toast the unprecedented African sunsets while drifting on a lagoon in the middle of the Okavango Delta. (Gunn’s Main Camp only, unless by prior arrangement and subject to delta water levels). Gunn’s camp will live long in memory. Plenty of Elephants, wildlife and beautiful Birds.